Good morning! I hope you all had a great weekend! Ours was packed full - with a basketball tournament - which the girls won gold in, volleyball tournament, soccer game, Princess House party, the Super Bowl and trying to plan and prep for some upcoming events! Busy, busy! To celebrate my birthday, I would like to give something to you! Everyone who chooses to participate will receive something! There are two different parts to this so be sure to read all the way through! For my local customers - If I get 10 people to each purchase $100 in product everybody will get a prize as specified below - some will receive more than others but everyone gets something! Plus all participants will receive a FREE class to make these 4 beautiful cards! AND your $100 order qualifies you for a free Sale-a-Bration item! So here's what you have the opportunity to win - they are all awesome prizes! Silver glimmer paper & adhesive pack (snail, mini glue dots, dimensionals and Tombow). Here's how you can play along. Email me your interest, along with your order by 9 pm on Thursday February 7th, 2013. On Friday the 8th, I will draw for the 10 prizes and email you what you've won. If a decision needs to be made on free product, 1/2 price items etc. you can get back to me by the end of the weekend. As mentioned, all participants are invited to attend the free class to make the cards above on Friday Feb. 8th at 7pm. 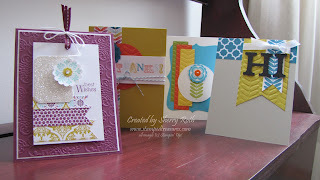 If you can't make it, you can choose to receive the pre-cut/embossed supplies to create the projects or the finished cards included with your order when it arrives. You should be able to play along as well! If you place an online order from my online store (or email me your order) of $100 or more (before shipping & GST) - remember this qualifies you for 1 Sale-a-Bration item - I will send you a kit including all the consumable supplies to create the 4 cards, with envelopes, along with instructions, or the finished cards with instructions - your choice. If you have any questions, please let me know. I look forward to celebrating with you this week!